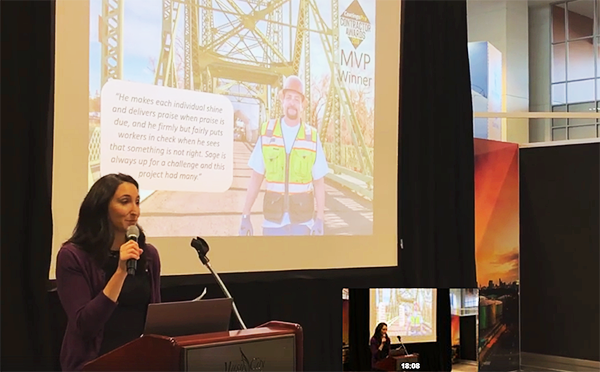 Hosted by CoatingsPro Editor-in-Chief Stephanie Chizik, the Contractor Awards Program was held on Wednesday, March 27 from 11:30 a.m. to 1 p.m. local time. The location of this year’s award ceremony was the Exhibit Hall’s Blue Theater at the Nashville Music City Center. The program awarded commercial and industry coatings contractors whose projects were nominated in these six categories: commercial concrete; commercial roof; industrial concrete;industrial steel; specialty project; and contractor/crew most valuable player (MVP).The MVP award is for a team or crew member deserving of special recognition for any outstanding accomplishment on the job site, such as an exemplary team contribution, safety performance, or communication practices. 1st place: Certified Coatings for "Jibboom Street Bridge Rehabilitation Project"
2nd place: Lakehead Painting for "Rail Tanker Cars and Dumpster Dry Ice Blasting"
1st place: Prime Time Coatings for "USS Omaha LCS-12 Jetavator, Shaft, Tunnel Propulsion Preserve"
2nd place: Howell & Howell for "University of Louisville Cardinal Stadium North End Zone"
Each nomination was entered by a coatings contractor, and nominated projects for the 2019 awards were completed between November 2017 and November 2018. There is no fee to enter the program. Submissions were rated by the CoatingsPro Editorial Advisory Group, comprised of industry experts. Congratulations to each of this year’s winners! Be sure to check back for information on submitting your project or crew for an award for 2020. Information on how to submit nominations for the next Contractor Awards program, to be awarded at CORROSION 2020 in Houston, Texas, will soon be available on the CoatingsPro website.